It's a quick way to recharge your batteries (unless you watch a really long one...which is entirely possible.) When I'm not watching President Obama sing pop songs (which is wildly entertaining,) I love watching Jimmy Fallon or Ellen. Watch an episode of your favorite show. I try to save watching movies for the weekend, but if I've been doing homework for six hours, I will let myself watch a couple episodes of Friends or New Girl. It's a great way to recharge my batteries. Exercise has a way of getting your brain to work. Try doing a six minute workout, or, if you're feeling a little more ambitious, my circuit workout. It's not even funny how much I enjoy these. I like this "Would You Rather" game the best, but if you're looking for more, look here. There's nothing wrong with a little social media in your day. Check out my favorite Instagram, Pinterest and Tumblr accounts. I'm more musical than artistic, so I usually opt to practice piano or regain my vocal skills from high school (they're on the decline!) but if you prefer another form of art, go for it! Do what you love. I know I already said "work out," but what I love about taking a walk is that you get to experience where you live. Whether you live in the city or in a college town, I'm sure there's something cool out there for you to observe! I stay clear of caffeine (it makes me so jittery,) so I stick to steamers, herbal tea and hot chocolate at the coffee shop, but choose whatever you prefer! I don't know what it is about the coffee shop atmosphere that is instantly relaxing, but I know it's a sure way to calm down when I need it. 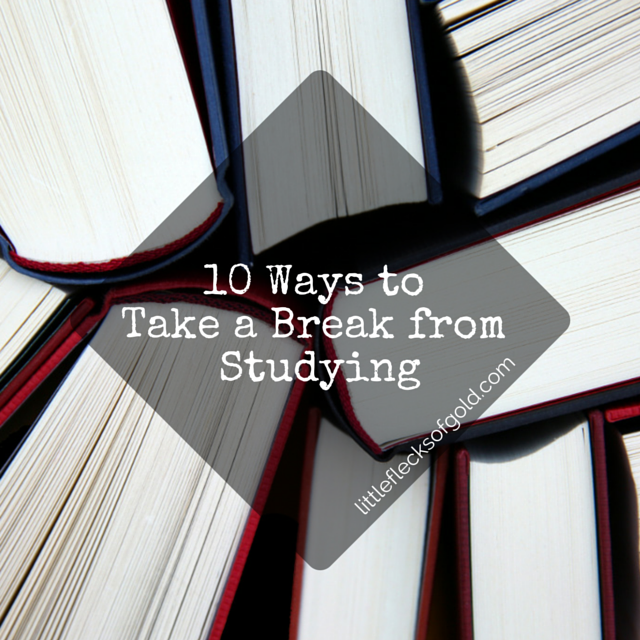 What's your favorite way to take a break from studying?